The collection is open for research at the Museum of Paleontology, with permission from the Museum Director. Contact Mark Goodwin for further information. 1937 Prospected in the New Mexico Permian near Jemez Springs and Glorieta. Also, excavated a plesiosaur (Hydrotherosaurus alexandrae) in the Panoche Hills, the cleaning and preparation of which was performed by Welles' WPA crew. 1946 Welles again joined Charles Camp in prospecting the Moenkopi exposures east of Dinosaur National Monument. Found more labyrinthodont bones. Welles' title changed to Principal Museum Curator and Lecturer. 1947 Excavated, with his students, a site which came to be known as Cameron Quarry. Charles Camp goes on African Expedition, and Welles appointed Acting Director of the Museum of Paleontology. 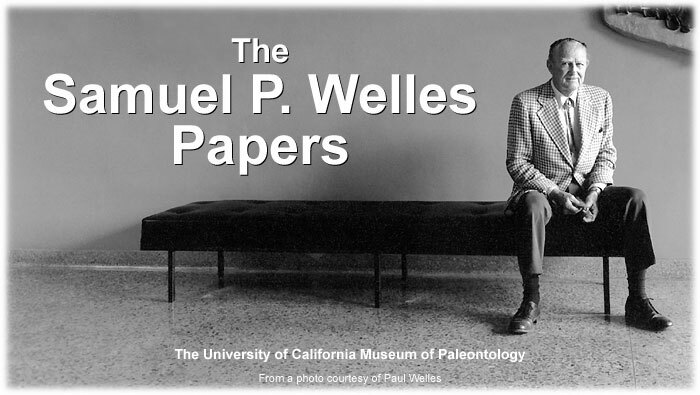 Welles' title changed to Principal Museum Paleontologist and Lecturer. 1954 Welles and his family joined Charles Camp's family at the Berlin-Ichthyosaur site in Nevada. Welles also went to the Moenkopi and Chinle Formations in Arizona. 1969 Was a Fullbright Scholar to New Zealand, where he studied marine reptiles. Welles' findings were published in 1971. 1981 Traveled to the Berlin-Ichthyosaur State Park to excavate and help preserve the location's rocks and fossils. 1989 Joined Dr. Kevin Padian's expedition to the Placerias Quarry. Welles died in San Mateo on August 6. Files on various reptiles. Arranged alphabetically by Welles' original writing on folders (generally alphabetized by family with genus arranged alphabetically within family). Miscellaneous articles and clippings related to paleontology. Also contains selected reprints, museum organizational information, and other miscellaneous items. The Sam Welles photograph collection consists of approximately 3,000 photographs, primarily of localities in which Sam Welles' worked. The photographs are currently uncatalogued.